Get your corporate name and message in front of thousands of people in your community year-round! Increase your positive public relations image! Provide Wells to churches, schools, and other local organizations. Spiral Wishing Wells have raised over $1 billion for various charities around the world. They are usually purchased by local charities, or by stores that host them on behalf of a charity. For instance, Wal-Mart stores use them to raise money for the Children’s Miracle Network, McDonald’s raises money for Ronald McDonald Charities, etc. If you haven't already seen a Well in action, this is an exciting clip from our partner in Japan. The one day income record in Japan is 75,501 yen! (US$686.37) The one-day record in the United States is $40,979 using our event strategies. There are two primary ways you can benefit as a sponsor. 1) You can provide Wells to charities that are placed in malls, stores, restaurants, theaters, bowling centers, libraries, animal shelters, YMCA's, sporting events, etc. All charitable organizations would love to have you as a sponsoring partner because it generates free revenue for them, and significant public relations benefits for you. We can help you set up a turn-key program that is easy for you and easy for the charities and stores. 2) You can also provide Wells to schools, churches, and other groups for their fund raising events. Churches love them for children's offering devices. Schools place them at their athletic events. And many charities conduct local fund raising events that often feature media coverage and focused campaigns. There is more about this concept on www.spiralwishingwells.com/loan-program. Think of it like this: There is no other way to advertise INSIDE retail stores or INSIDE churches. But Spiral Wishing Wells are the Trojan Horse" of advertising which gives you the opportunity to promote your company INSIDE these otherwise unavailable locations. 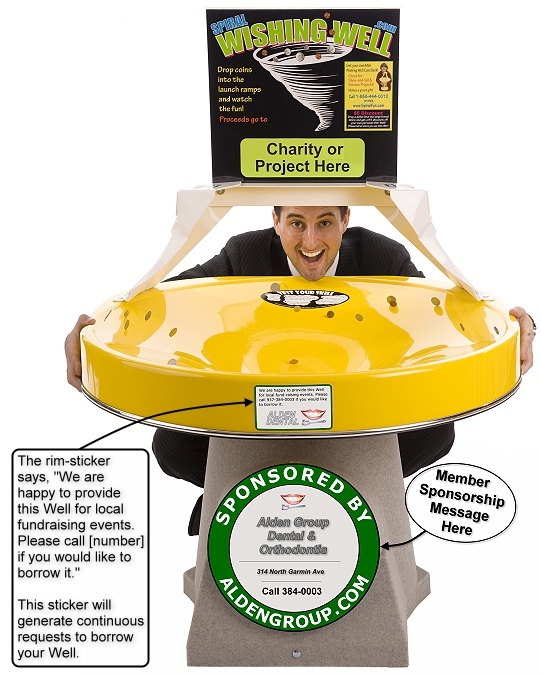 Using the sponsorship sign and rim sticker described on the Loan Program page, get a Well for your store where it will raise money for your favorite charity, and loan it out to churches, schools, and other charities for their events! It will be the easiest and most effective advertising method you will ever see! Who benefits from the coin revenue? If you want to cover your entire city, you can "brand" the whole market with your Wells. Everywhere that people see them, they will think of you and know that you are supporting your community. This is not a typical advertising opportunity. Radio, television, and print media are short term (usually one impression) and very expensive. 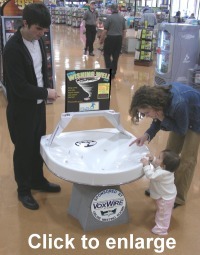 The Spiral Wishing Well Corporate Sponsorship Program provides visual and interactive impressions for many years. The Wells do not wear out, and they have proven themselves to appeal to all generations. Many of the Wells we placed in 1985 are still generating as much revenue as ever, and the children that tossed coins in 20 years ago are now parents handing their own children coins. So for a very small cost, Spiral Wishing Wells will provide decades of exposure and positive public relations for you. We welcome the opportunity to discuss a program that fits your specific needs and market. Please contact us to set up a meeting or call me directly at 1-937-985-5863 (Eastern USA).